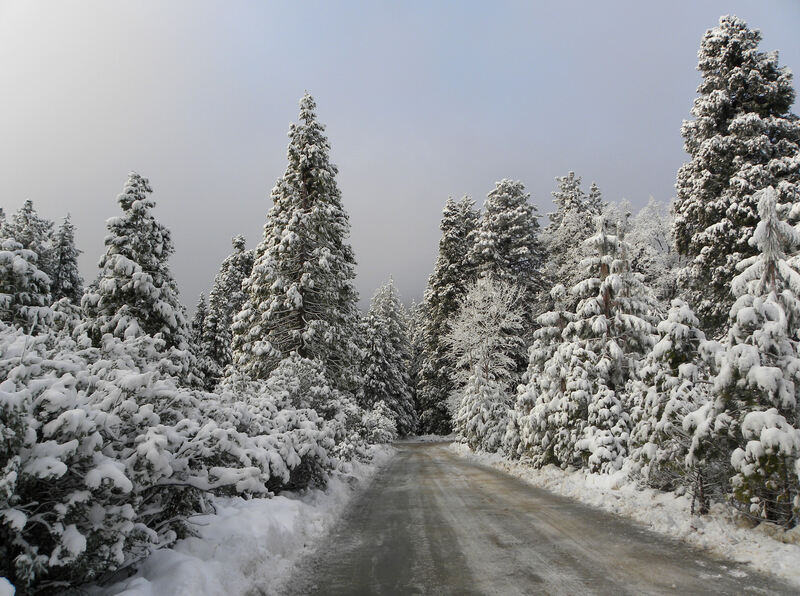 Posted on January 7, 2010	by Lou Murray, Ph.D.
Vic and I have stayed at Curry Village, the Ahwanee Hotel and the Wawona Hotel in Yosemite National Park, but keep returning to Tenaya Lodge, a fabulous resort just outside the park. 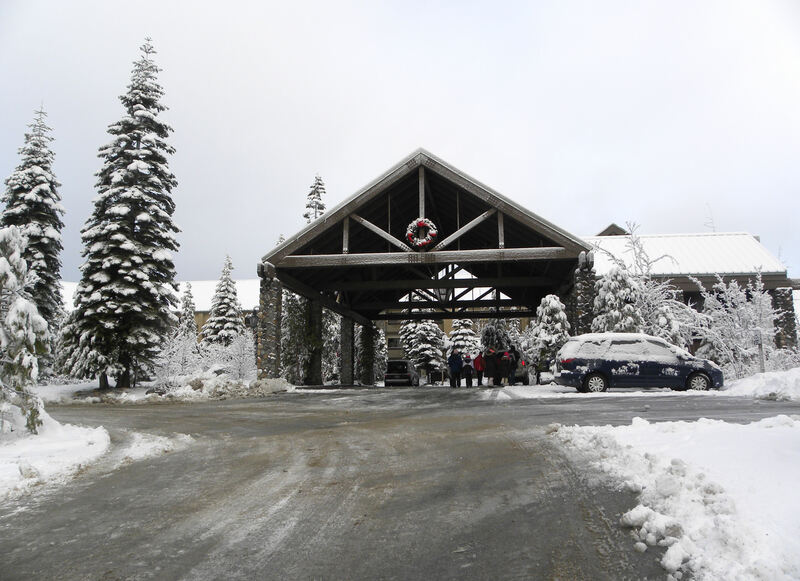 With an ice skating rink, indoor Olympic pool and two whirlpool spas, a full-service spa, snowshoe rental, and snow play area, there is always something to do. 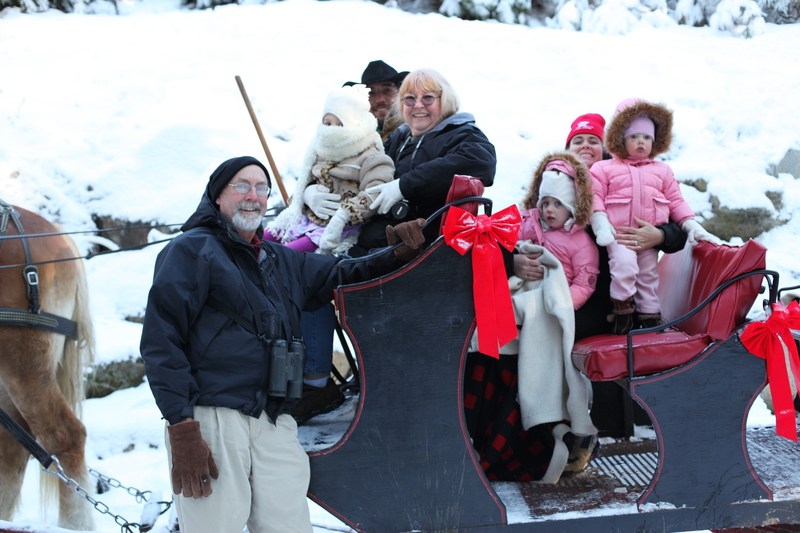 This was our sixth consecutive winter visit there. When you arrive, Bell Captain Bruce Howard and the valets greet you like returning family members, setting the tone for a fabulous stay. 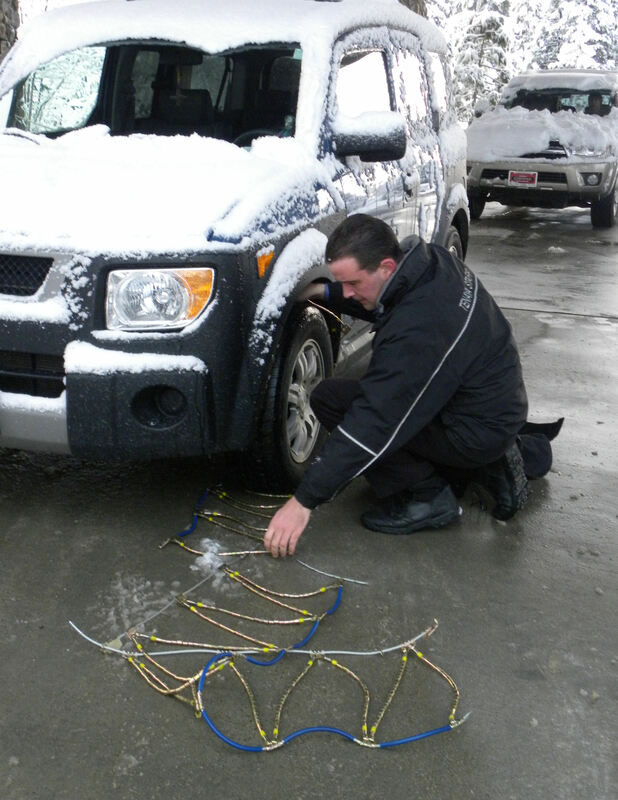 Installing or removing chains is a complimentary service provided by the valets, although tips are appreciated. 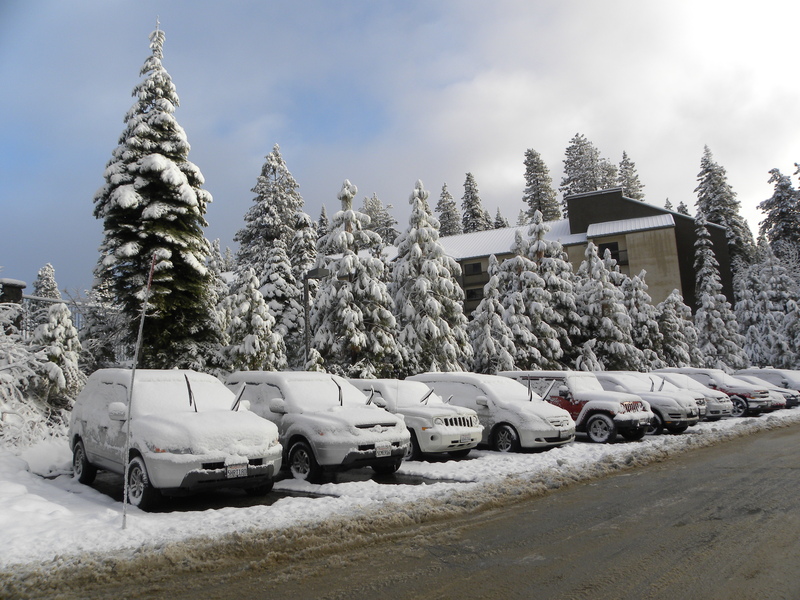 The complimentary valet service includes cleaning snow off the car. 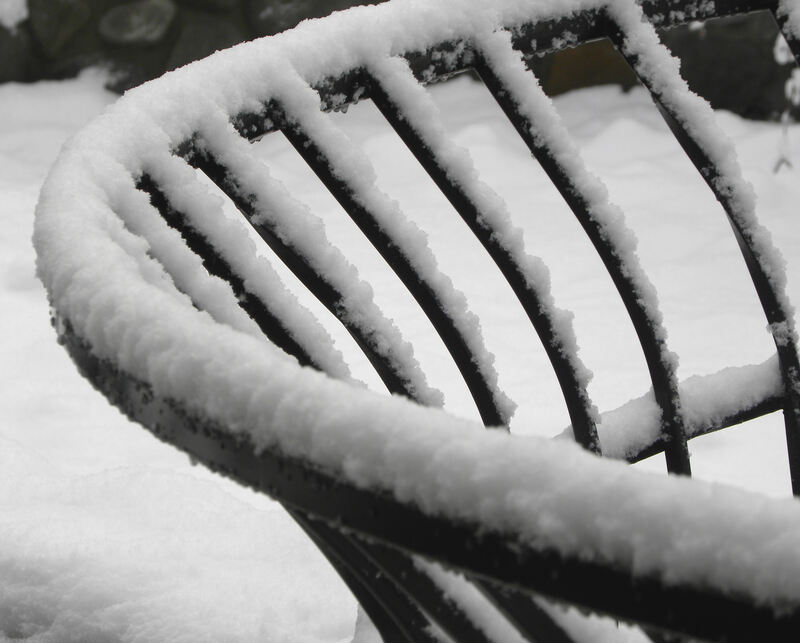 A fresh snowfall turns the grounds into a winter wonderland full of fine photo ops. 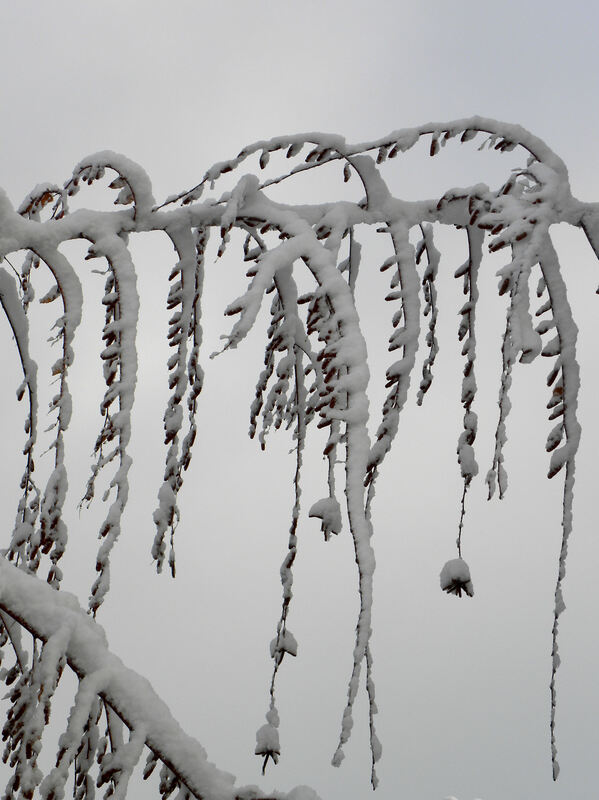 Snow on branches turns them into works of art. to buried grasses, everything becomes a camera subject. Even the metal firepit becomes a work of art. 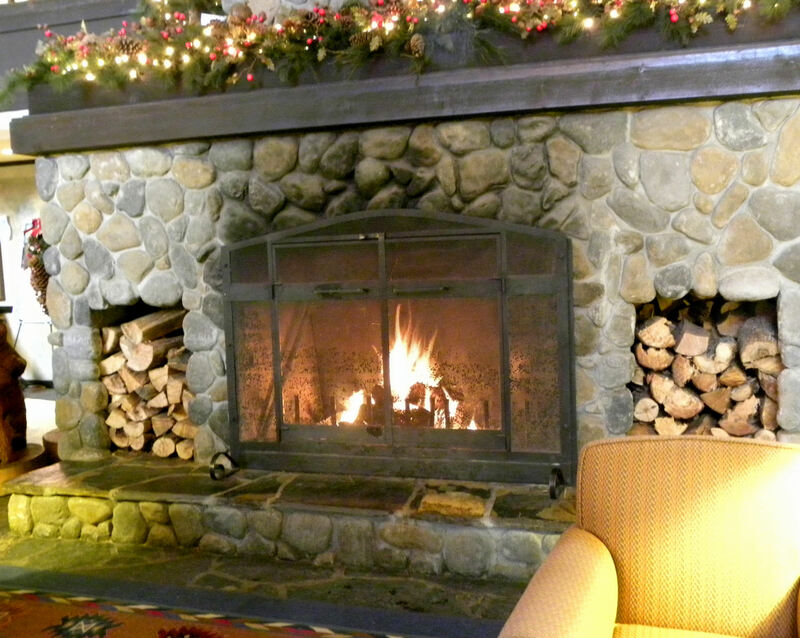 After playing in the snow, it's nice to relax by the fire in the lobby, especially with a hot beverage. 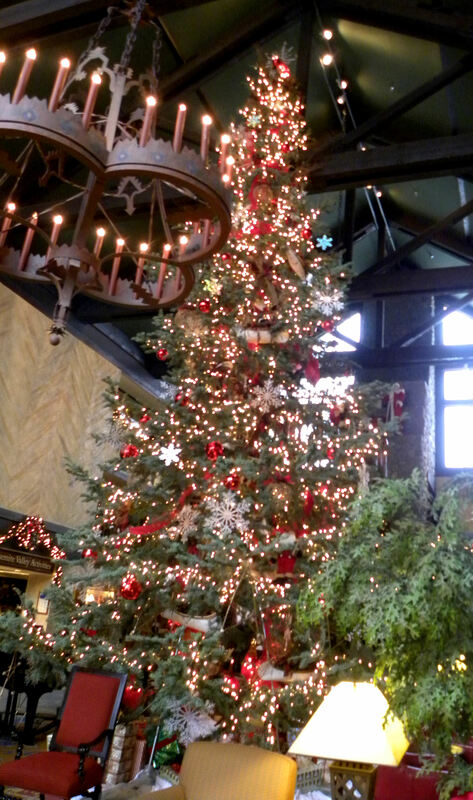 We admired the magnificent 40 ft white fir in the lobby. The breakfast buffet at Tenaya is not to be missed. 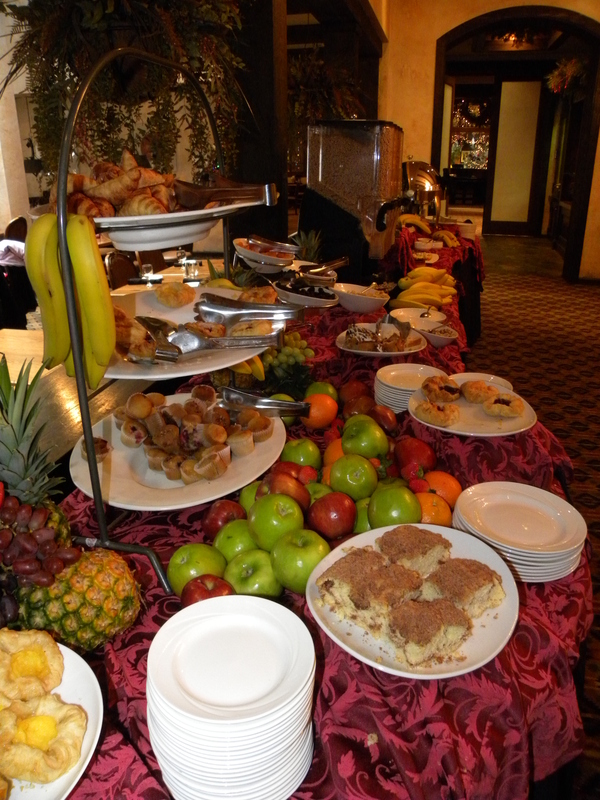 This is only a small portion of the fresh fruit, hot dishes, and pastries that are offered each morning. 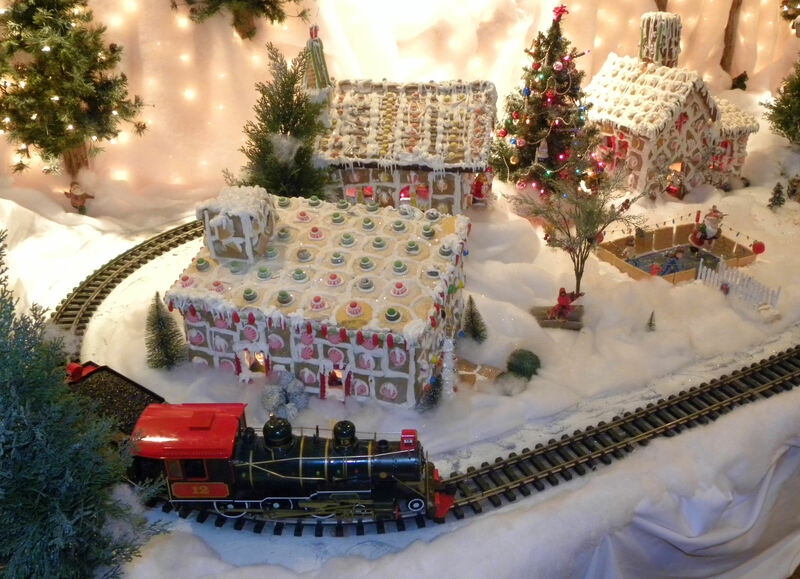 The model train layout runs through a gingerbread village that fascinates the children. 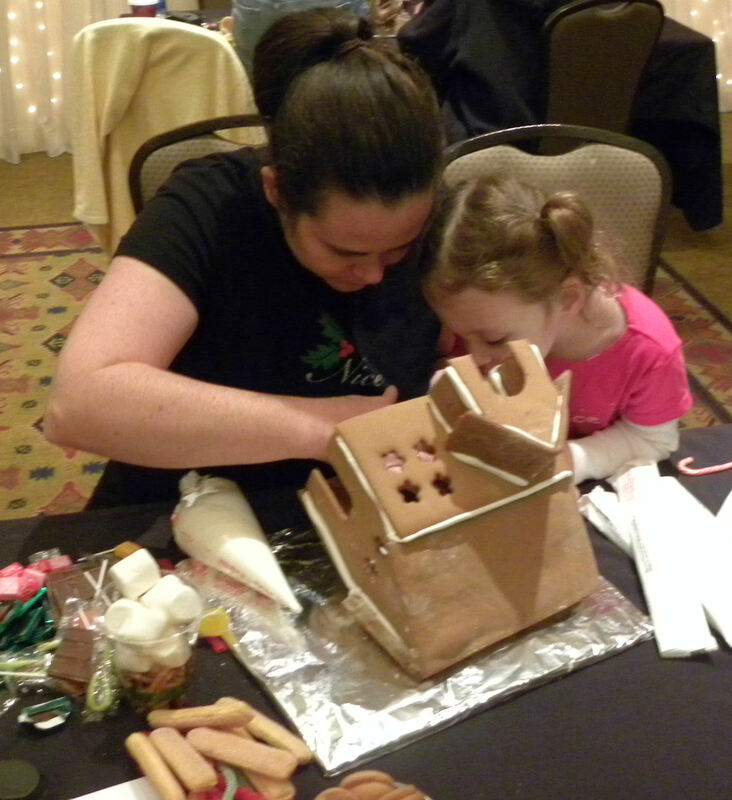 We were lucky enough to be at Tenaya when the chefs put on a gingerbread house decorating workshop. 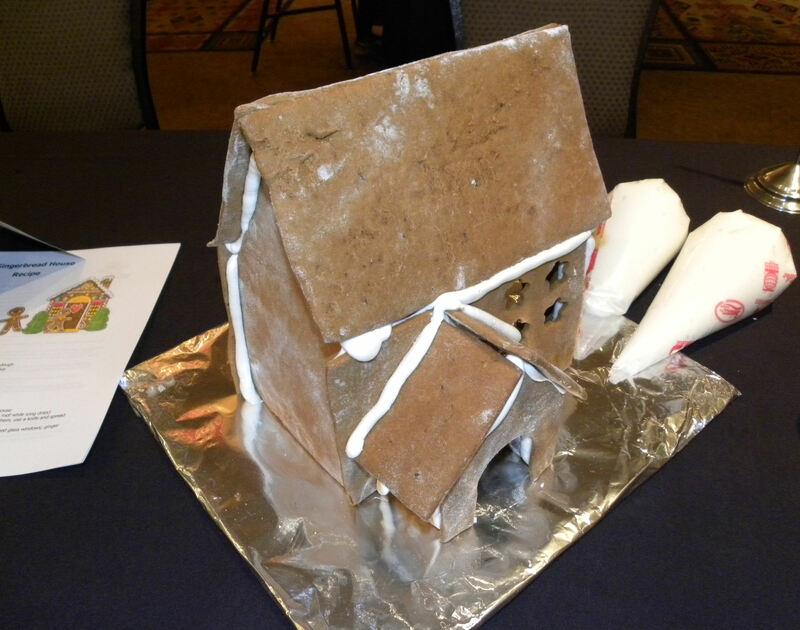 Nicole and I signed up and each got an assembled house to decorate. Nicole and Allison put gelatin windows inside the house. 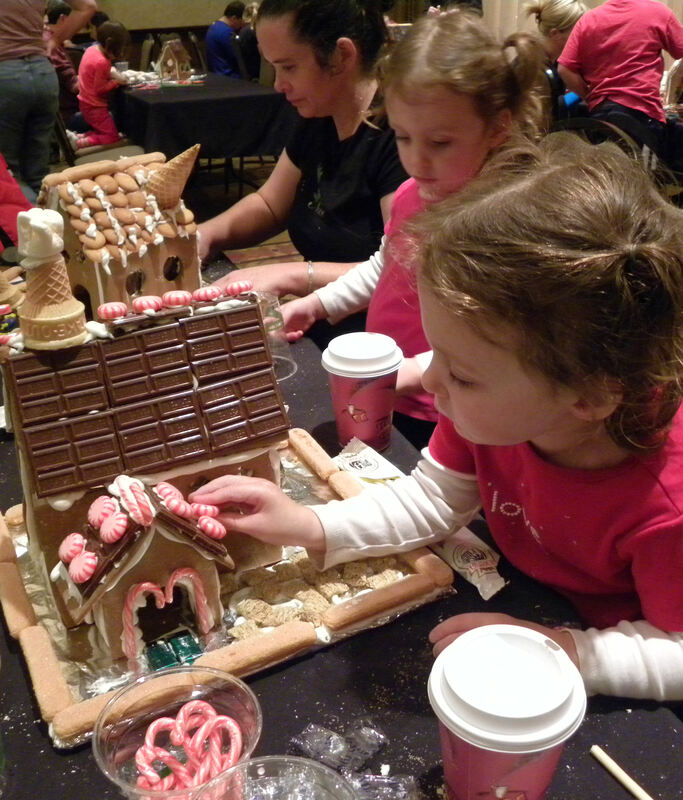 The twins were more interested in eating icing and the candies than decorating the houses. Nana was complicit, I'm afraid. Allison did a good job sticking peppermints onto the roof. But when their Mom told them they couldn't eat any more candy, the twins hid under the table and licked icing off each other's faces. Silly girls. It's a race against the clock to get finished, and there wasn't enough time. This was my finished house. While the grandbabies were napping, Vic and I went for an late afternoon stroll. 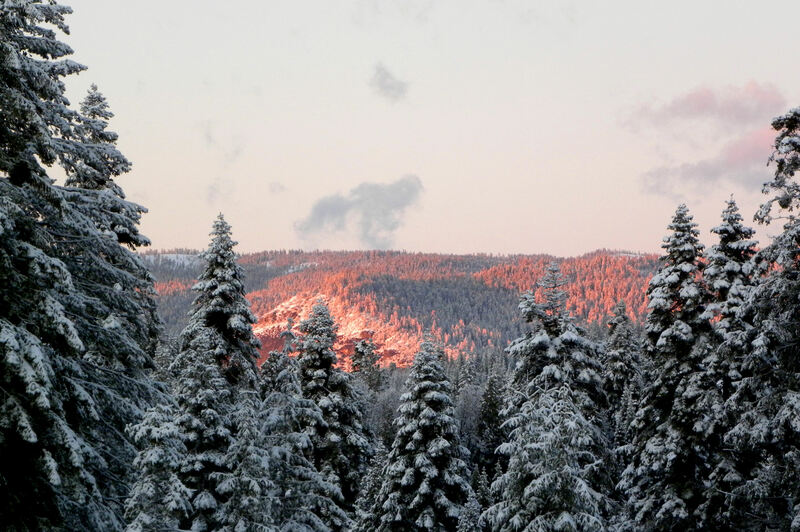 The sunset reflected on snowy hillsides was spectacular. 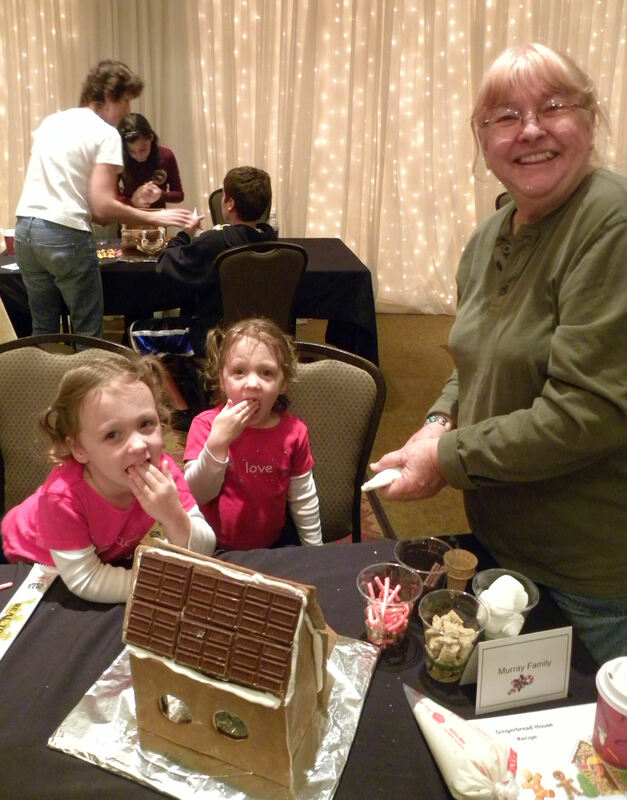 Nicole signed the twins up for an evening of crafts with Santa and his elves. The rest of us had a delightful dinner in the Sierra, a newly opened fine dining restaurant at Tenaya. Here our waiter Matthew makes a fabulous Caesar salad at the table. The lobster bisque with black truffle crust was exquisite. I had Filet Oscar, a 6 oz. filet topped with artichoke bottom, Dungeness crab, and Bernaise sauce. Beef comes from the Brandt family farm in Brawley CA and is raised naturally without hormones or antibiotics. 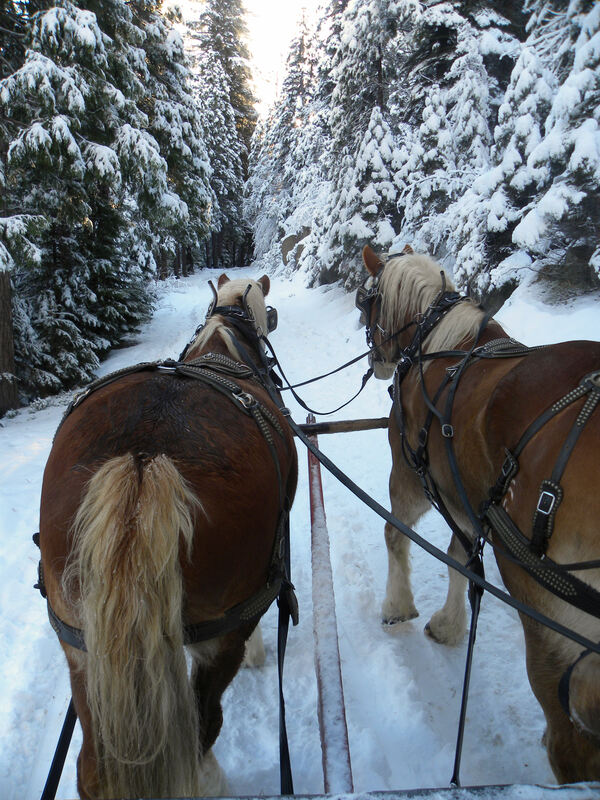 On our last morning there, I signed us up for an old-fashioned sleigh ride down a snowy trail behind a team of Belgian draft horses. 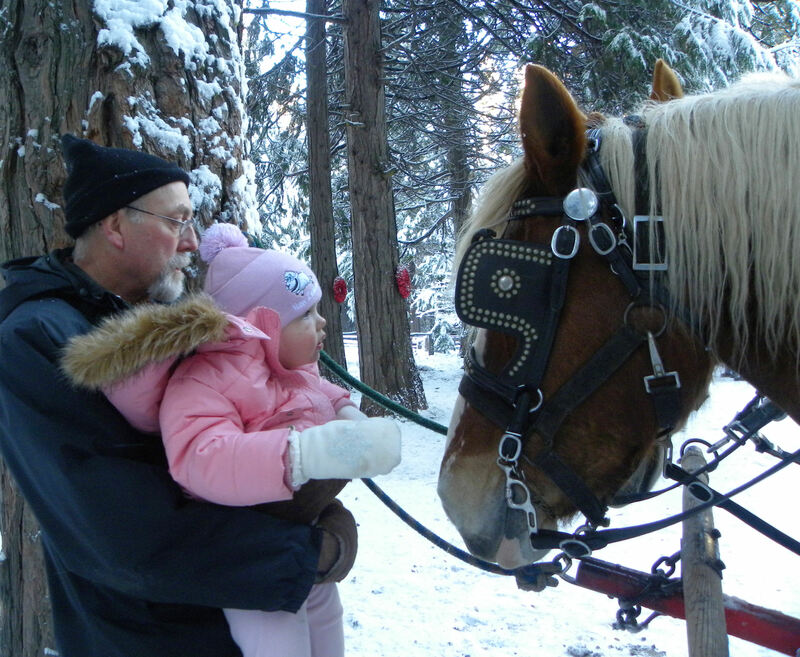 The destination for the ride is the stables, where we relaxed by a fire and had hot cider. Vic held Megan up so she could pet the huge horses. 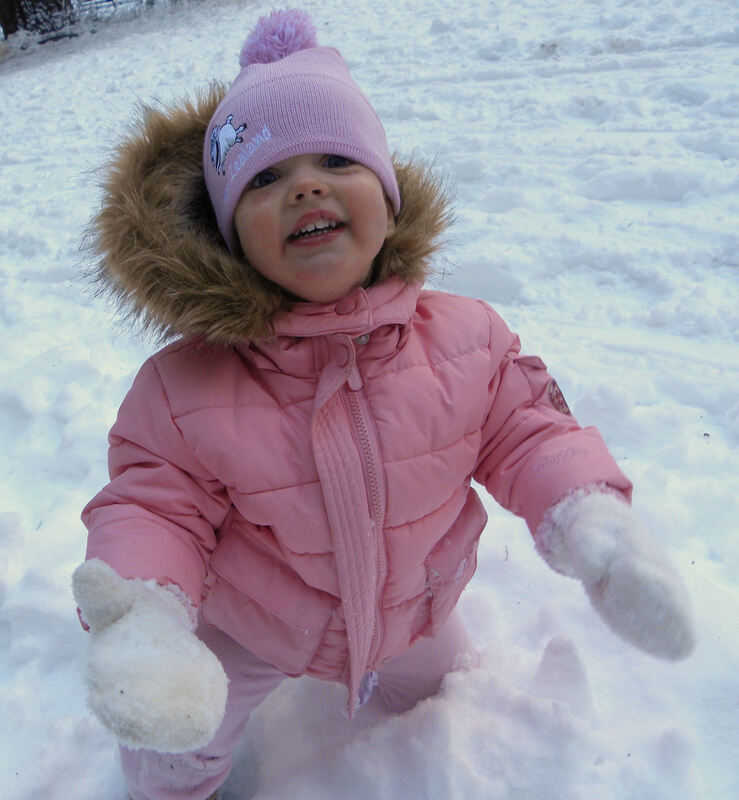 Megan enjoyed playing in the snow, a new experience for her. 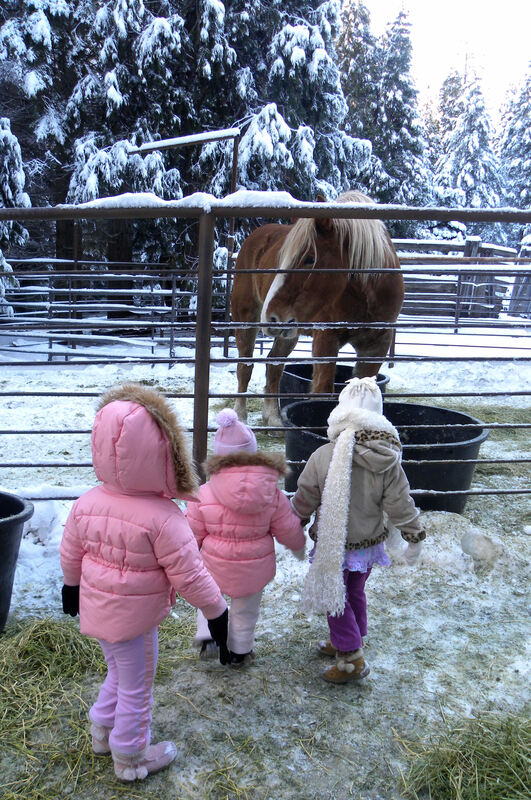 All three girls enjoyed seeing the alternate team resting in their corral. Scott took our photo after the ride back to the lodge: Papa Vic, Lauren, the driver, Nana Lou, Allison, Nicole and Megan. What a fun Christmas vacation. 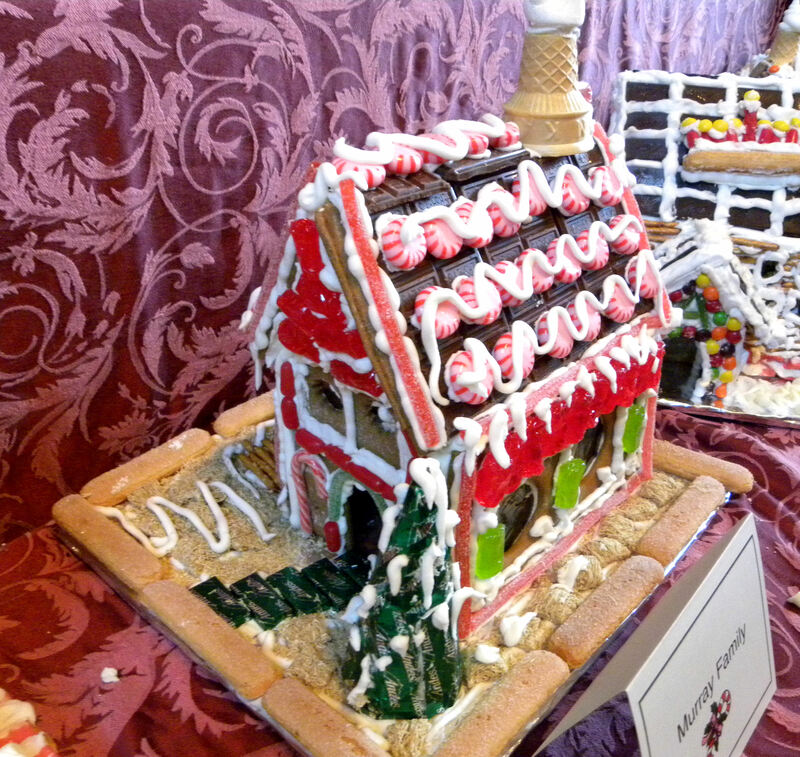 This entry was posted in Uncategorized and tagged gingerbread house, lodging, photography, sleigh ride, Tenaya Lodge, winter, Yosemite National Park. Bookmark the permalink. 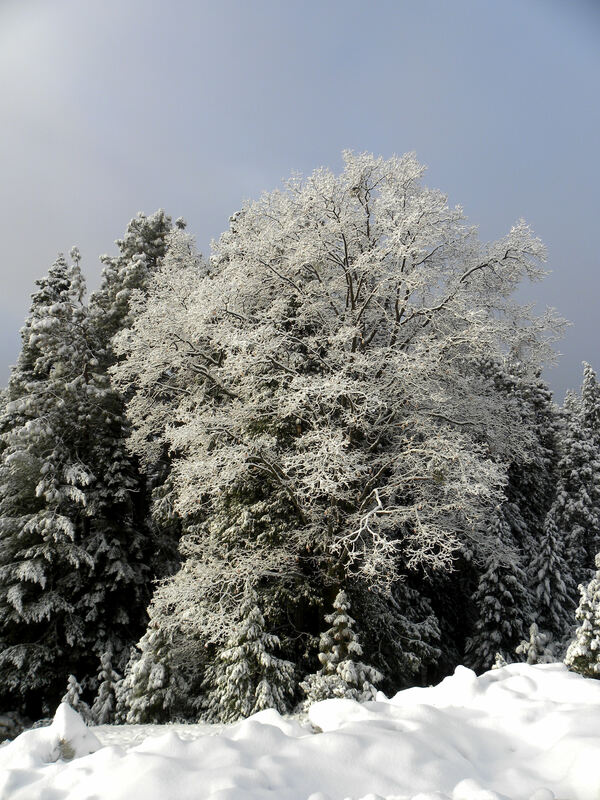 What a lovely account of your stay in Yosemite and Tenaya Lodge. I’ve worked at and around Tenaya for nearly a decade, and this is by far the most enjoyable travel journals I’ve read about our area. 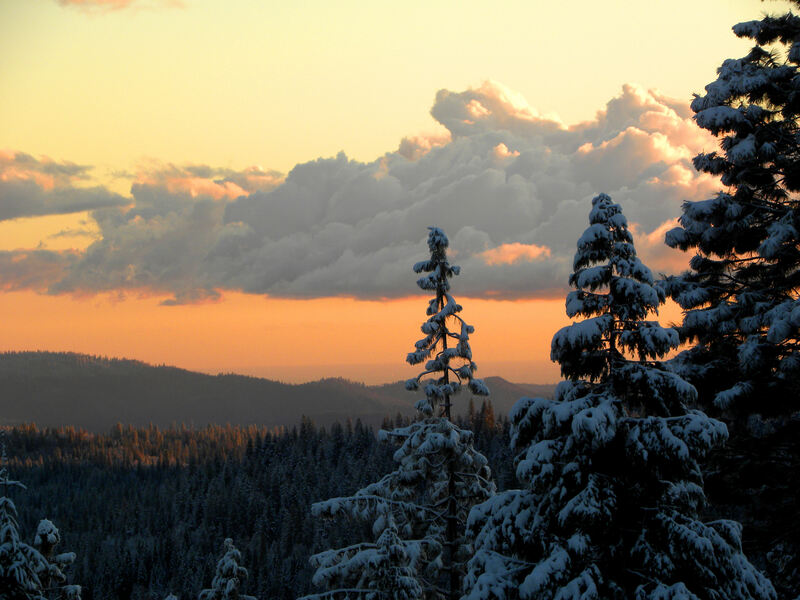 Thanks you for being a guest, fan and lover of the Yosemite area! 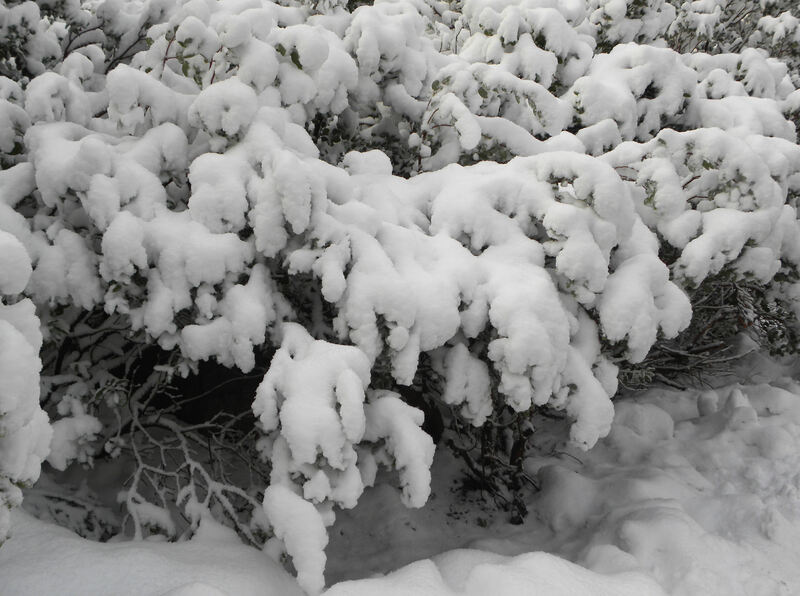 Warmest Regards & Very Happy New Year to You & Yours! Hi Jonathan, You’re welcome. I hope you’ll pass the link on to Matthew, our waiter, Bruce Howard, the bell captain, Frederick, the chef, and Tom McCann, the manager on day duty during our stay. We received outstanding service from them all. Also, be sure to check out my newspaper column in the HB Independent about the trip. The link is at the bottom of the blog post. VERY PRETTY! It looks like you had such a wonderful time. I’m hoping to get to visit the national parks one day, maybe when my son is a bit older. Sound like the perfect vacation to me. There are so many wonderful things to see near you too–Sturbridge Village, Mystic Seaport, and many wonderful museums. 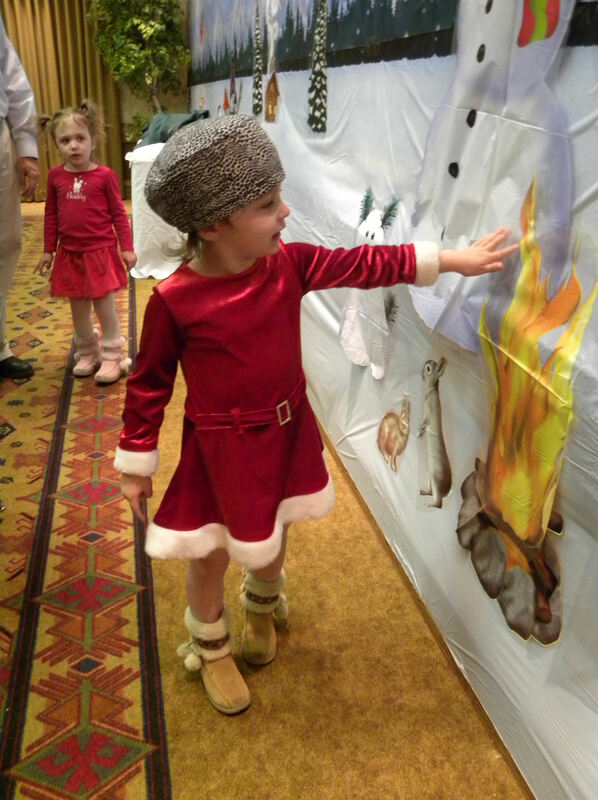 But if you ever get to Yosemite, Tenaya Lodge is a great place for kids. So much for them to do there, more than in the park itself. Hi Lou, what a grand vacation you had with your family. I love your gingerbread house. Yosemite is on my list of “places to visit before I die” and I’ll keep your lodge recommendation in mind. 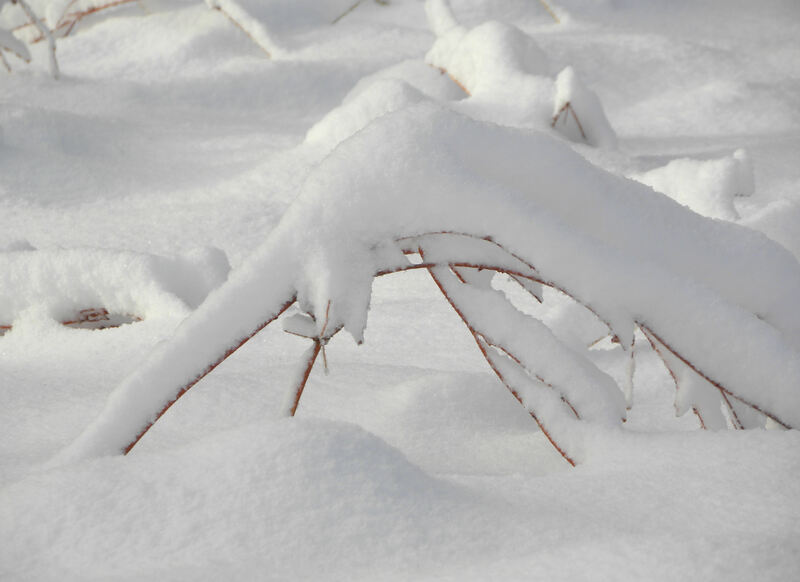 Did you go snowshoeing? I’ve tried it out and found it to be surprisingly easy and fun. 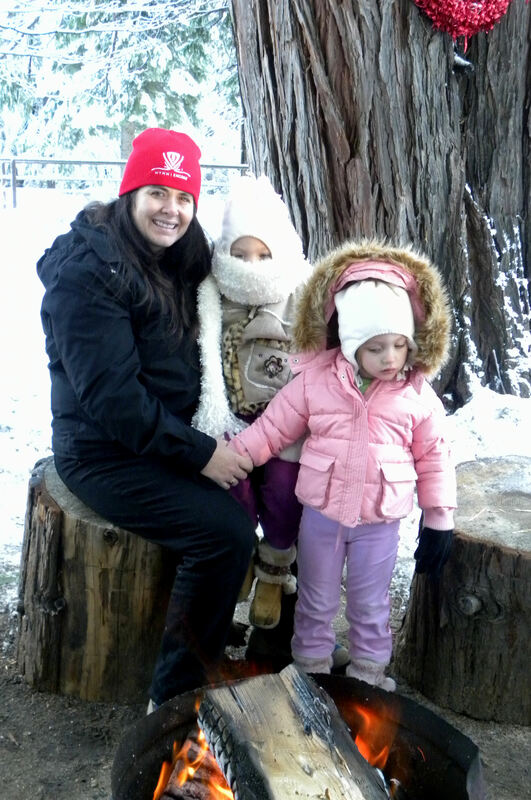 We didn’t go snowshoeing this year, but did on our visit last year. Yosemite is a long way from Germany, but I hope you get to see it someday.